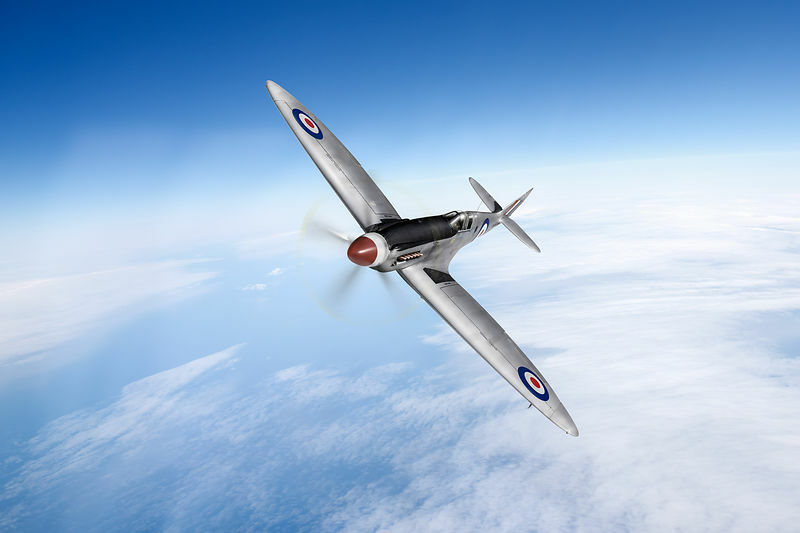 This is a depiction of RAF photo reconnaissance Spitfire PS852 of 81 Squadron, based at Kai Tak, Hong Kong, in 1952-53. This is the aircraft that Flt Lt Ted Powles AFC had used to make daring spy flights over Chinese territory during the Korean War, pushing it to the extreme limit of its fuel range. He also took it to a world altitude record for piston engine aircraft of 51,550 feet on 5 February 1952. When the cabin pressurisation malfunctioned he then made an extremely fast descent, although the actual speed he attained is disputed. The picture was commissioned for the RAF Memorial Flight while their PR Mk XIX PS915 was being repainted in the colours of Powles's machine for the 2016 display season, and used in their visitor guide at RAF Coningsby.